Spacious 1 bedroom apartment, Full shower, Sleeps 2. Two min. walk to beach. Hale Moana is a Non-Smoking studio apartment nestled beneath two lovely shade trees with a 'treehouse' view. The studio is cooled by refreshing island tradewinds and by the shade from our Monkeypod and Tamarind Trees. This space has interior teak and bamboo furnishings which rest on a cool, quartzite slate tile floor. Private parking & entry to a 750+ square foot studio and lanai. The interior also has a vaulted ceiling with skylights and plenty of light throughout. Gas two-burner cooking inside and a gas BBQ grill outside. 39' TV. Wifi - password provided. Many happy visits and repeats. Aloha for now! RENTAL DESCRIPTION/HOUSE RULES: Attached studio with private entrance and parking. No air conditioning, no breakfast provided, no maid service. On-site parking for one vehicle only. Hands-on owner lives on island/property. Kailua Beach is approximately 200 yards from the property. No smoking in the rental or on the rental property. Maximum occupancy of the rental is two (2). No parties, events, or gatherings. PLEASE CONTACT FOR MOST CURRENT & ACCURATE CALENDAR :) ! FLEXIBLE 5 NIGHT MINIMUM. $160. p/night + $125. cleaning + 15% HI GE/TA taxes + HomeAway Reservation Fees based upon your total. If you would like to contact me directly please make a request with HA/VRBO customer service for my phone and e-mail or contact me via the HomeAway or VRBO reservation platforms. Booking Inquiry = interested, seeking additional information. Booking Request = ready to book with a CC through HA/VRBO platform. This home was built for our tutu, Moana, in 1939-40; it was one of the first houses in the neighborhood, when the streets were paved with crushed coral. Moana married and moved to Kailua, from Waikiki, to raise a family of three. The older generation remained in Waikiki, in the family home there, until the mid '50's. We built onto the main house in 2003 to create what is now our studio apartment, Hale Moana. We hope you enjoy the space we've created as much as our guests, friends and family members do. 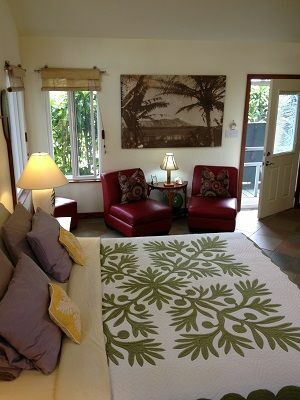 This spot in Kailua is close to the beach and just far enough away from Kailua Town to be the perfect jumping off point for an island excursion, a lazy day down the access path to the center of Kailua Bay or for enjoying the happy bustle of Kailua Town with its shops, food and activities. The bathroom is a favorite! Open shower, room enough for two. Come in from the beach and hose off on the lanai or come right into the shower room for a warm water rinse. Beach towels, too! Spare set Cal king bed sheets. Use the dryer or extendable clothesline. Private parking slip on property. Pull up to the tree swing. Yes. Wireless internet. Password provided. Apartment size fridge (not mini fridge). See fotos. Two burner gas counter top cooking. Everything you need to prepare a meal and please ask if you have a special kitchenette request for cooking gear. Tables for two inside and out for dinner in or BBQ dining on the lanai. The studio has HD basic cable TV service. DVD player. Radio/CD player with USB charging port. Radio/CD player and a few local music CD's provided. Local books and a few 'readers' past guests have left for others to enjoy. Bookends bookstore in Kailua Town is the best! Our Kailua Public Library is awesome, too! There are a few Hawaiian CD's for you to enjoy. There are a few DVD's for you to choose from. Your lanai has seating, BBQ, W/D, clothesline. Various fins, masks, snorkels, beach toys. Kailua Community Center pool nearby. Private washer and dryer on studio lanai. I highly recommend the accommodations here. It’s a great location with beach access across the street. The cottage has all the amenities you will need down to beach chairs and snorkel gear. The layout is comfortable and private. A lot of thought went into designing the cottage. But most of all, Jennifer is a wonderful host. She was very gracious and is great about recommending restaurants and things to do in the area. Thank you for a relaxing stay. We look forward to staying again! Everything was top notch. Great decor and all the amenities you need. Short walk to the beach. Jennifer was very helpful and there if we needed her. Cosy, private and we’d definitely stay here again. This is a beautiful property - great location, great amenities and attentive owner. This is a beautiful property located about 1 1/2 blocks from a swimming beach (good for kids also), and about 1/2 mile from Kailua town, where there easy access for coffee and Whole Foods and Safeway markets. We like to cook, so we used the kitchen and cook burners everyday, and there also is an outside grill and a deck. The place had beach chairs and boogie boards, which was a fantastic amenity - we used them all. And, the king bed was very comfortable! Perfect place to live like a local. Enjoyed the sunrise every morning and walked the quiet beach. We had an amazing stay here in the Hale Moana for 10 days! This is our third time to Kailua and our first time in this wonderful place! It’s our new favorite!! It is very spacious…beautifully decorated…has everything that you need and SO close to walk every morning to the beach! Very close to town and yet hidden away and very private! Jennifer is a wonderful host, making sure that our stay was perfect! We are looking forward to returning again next year!! Kailua - windward side of Oahu. Nicely situated, beautiful town and ocean. Between Waimanalo and Kaneohe. Main roads in and out are Kamehameha Highway ('circle island' route, 'beach road'), Pali Highway (Kailua to Honolulu/Waikiki) and H3 Highway (Kailua to Pearl Harbor). My Hale Moana is just up from the Kalama Beach Club and Kalama Beach Park, cross the "beach road", walk the sandy access path and you are at the center of Kailua Bay; a three mile stretch of one of the "best beaches in the U.S.". $160.00 USD per night + state taxes GET/TAT (15%) + one time cleaning fee ($125.) Service Fees charged by HomeAway/VRBO. Cal King bed. 2 person maximum. PLEASE INQUIRE FOR CURRENT & ACCURATE CALENDAR AVAILABILITY Aloha! Flexible stay. Credit card payment processing (fee) through VRBO/HomeAway and VacationRentPayment. Please read the reviews of my Hale Moana apartment to get a feel for our space from past guests. NON-SMOKING UNIT Here's to a great stay; thank you in advance for your inquiry! Aloha! RENTAL DESCRIPTION/HOUSE RULES: Attached studio with private entrance and parking. No air conditioning, no breakfast provided, no maid service. On-site parking for one vehicle only. Hands-on owner lives on island/property. Kailua Beach is approximately 200 yards from the property. No smoking in the rental or on the rental property. Maximum occupancy of the rental is two (2). No parties, events, or gatherings. CANCELLATION POLICY: Your payment will be refunded if we are able to subsequently rent - the dates reserved for you - to someone else, or you may transfer your booking and any monies received to future dates at Hale Moana.